ECHINODERMATA : VELATIDA : Solasteridae STARFISH, SEA URCHINS, ETC. Description: A starfish with many arms, usually 13 but occasionally from 8-14. Colour is variable from dirty brown through dirty purple to a beautiful red form with concentric rings of white. The texture is very spiny with large groups of bristly spines over the dorsal surface. Typically 25cm up to 35cm diameter. 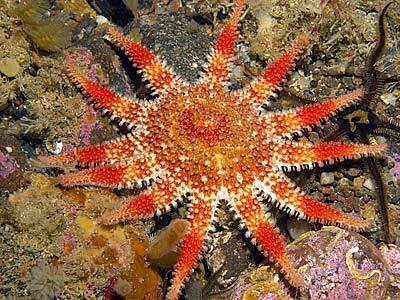 Habitat: Found in sheltered sites with moderate tidal streams and semi-exposed rocky or bouldery sites. Frequent in brittle-star beds. Distribution: Common and widespread all round the British Isles but rare on the south coast. 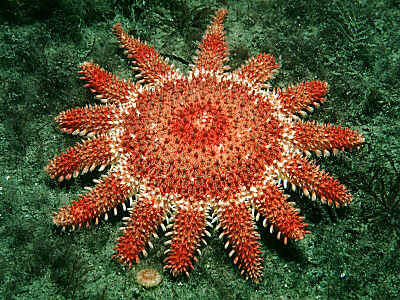 Similar Species: The only other sunstar to be found in shallow water is Solaster endeca. Clusters of sharp spines all over body. Picton, B.E. & Morrow, C.C. (2016). Crossaster papposus (Linnaeus, 1767). [In] Encyclopedia of Marine Life of Britain and Ireland.